Part of KXT’s mission is LOCAL. Like, hyper-local from all over North Texas. For the Fall Fundraising Campaign, we’re working with Denton artist Nevada Hill. For those who love local music, you’ve seen his work all over town, having designed posters and shirts for Good Records, The Polyphonic Spree, The Granada Theater and more. Art&Seek featured him and his work a couple years back on their blog. Loads more about Nevada below. 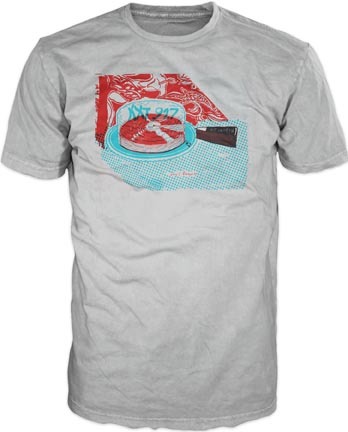 Support KXT today and secure a ‘Vinyl Dessert’ shirt (above) and poster (same design). They’re only available during the Fall Fundraising Campaign! Nevada Hill is a internationally known artist/illustrator/screen printer who lives and works in Denton, Tx. Upon observing the punk rock scene in Fort Worth (his home town) at a young age, he decided that his distaste for everything mainstream was grounded on the firm belief that EVERYTHING CAN LOOK BETTER.Hill uses art and music interchangeably and takes advantage of mainstream media vehicles to distribute his work (instead of galleries). Nevada made the trek to UNT in Denton in 2002 where he signed up for the fine art major he knew the least about (printmaking). He fell in love with the medium of printmaking because of its capacity to create multiples and for its ability to produce texture. Hill went on to work with Art Prostitute in 2004. Climbing up the hierarchy there, he eventually became resident artist. The Art Prostitute experience opened his eyes to alternative art spaces and the possibility of surviving on his creativity. Later, Hill was influenced by the birth of his now 6-year-old daughter. Her drawings made him remember the sensation of creating without reference. 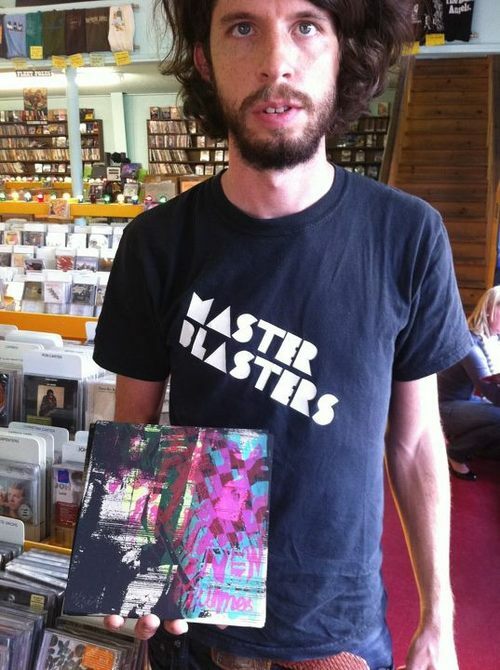 Nevada has worked an overwhelming amount of small jobs as well as participated in an excessive amount of bands, including being co-leader of the avant garde noise free-for-all, Zanzibar Snails. Now he is moving on to more recognizable–but just as intense–musical skree in the bands Bludded Head, Mortville, and Drug Moiuntain. Most of Hill’s story takes place in his secret Denton studio where he screen prints, paints, and thinks about philosophy. Also, he gets to hang out with his daughter and tries to skateboard everyday. Thank you Nevada! We dig your work.